We woke to a sparkling morning at the beach, so I was swimming before breakfast. A super treat!! The Diva's challenge #105 is Margaret's delightful dansk, it reminds me of tiny fish in whirlpools. Visit The Diva's blog for her special giveaway which is Carole Ohl's fantastic 'Tangle A Day' Calendar. 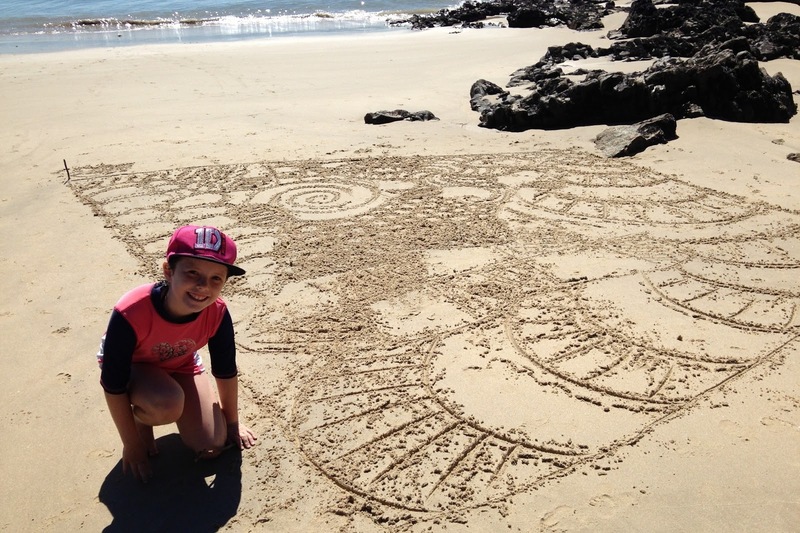 Love your tile for the challenge and the large zentangle art on the beach! Enjoy your camping trip with you grandkids! I LOVE your tile! The sand zentangle is also great. I love this (Buddhist) idea. oh wow! Cool! 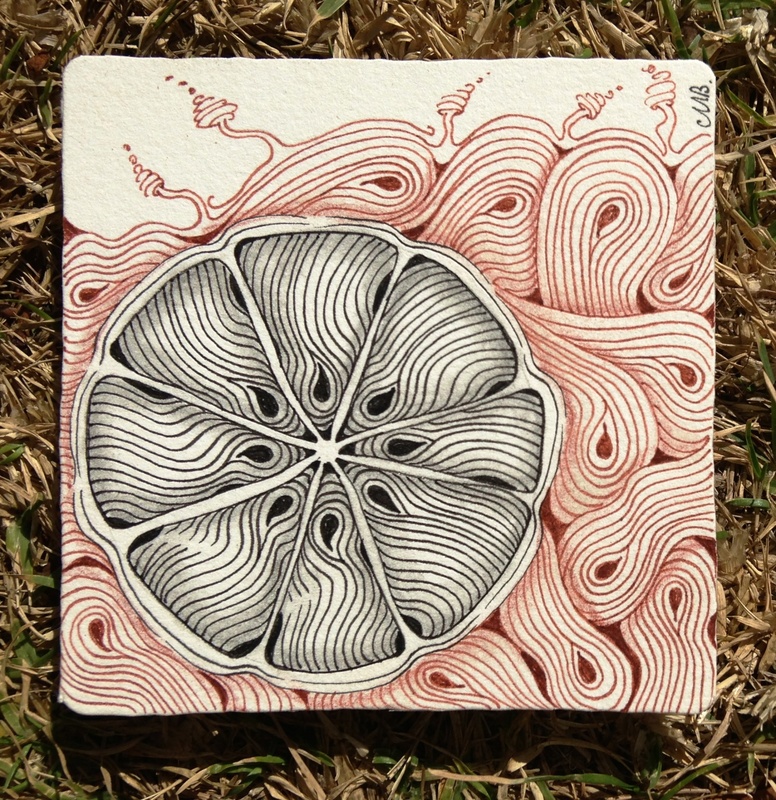 What a wonderful way to zentangle the day... thanks for sharing! I love the flow of the Dansk in your tile! It has a body of beauty! Really like the tile you created. Like the two different uses of Dansk. Illustrates its versatility well. 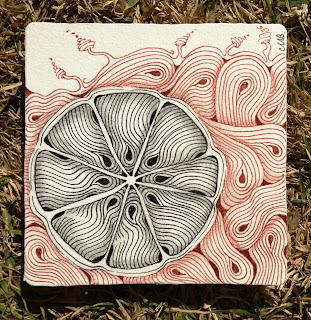 Wow, beautiful art and I adore your sandzentangle! Shelly, it is a beauty. Great composition, lovely execution. I love the structure you placed this pattern within - it works so beautifully! 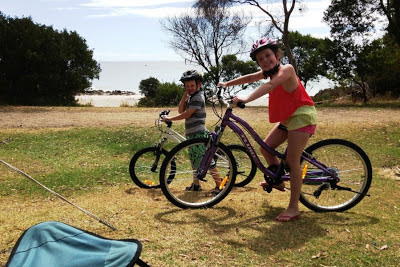 Your pictures remind me that you are in summer - can't wait until you are through with it and send it our way! Lovely tile. One sand dollar and a swarm of fishes. Lovely, I really enjoy your innies and outies on Dansk. The way the teardrop meet in the center is wonderful. What a great post! I love the sand dollar tangle with Dansk. The beach tangle is amazing!